Albers boxes are a shout-out and a series of warm and sloppy kisses for the artist Josef Albers and his book about the Interaction of Color. 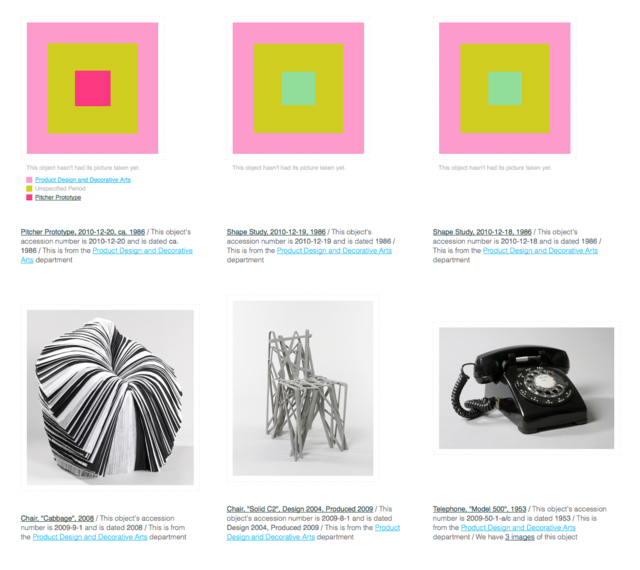 We show Albers boxes when an image can't be found or when an image has not yet been digitized using the conentric squares as a device to convey some of the information we know about an object. When you mouse over an Albers box we display a legend for each one of the colors. We are trying to imagine a visual language that a person can become familiar with, over time, and use a way to quickly scan a result set and gain some understanding in the absence of an image of the object itself. If you're wondering how the colors are chosen take a look at this lovely blog post from 2007 from the equally lovely kids at Dopplr. They had the right idea way back then so we're just doing what they did! The object timeline is an interactive visualization depicting when an object was produced and when that object was collected using some of the major milestones and individuals involved in the Cooper Hewitt's history itself as a bracketing device. Specifically the years 1835 when Andrew Carnegie was born and 2014 when the museum will re-open after a major renovation to Carnegie's New York City mansion where the collection is now housed. It's not that Andrew Carnegie's birth signals the beginning of time but rather it is the first of a series of events that shape the Cooper Hewitt today. The timeline's goal is to visualize — and to continue to develop a visual language to represent — an individual object's history relative to the velocity of major events that define the larger collection. Wherever possible we show both the start and end dates for an object represented as its own underlined event span. If we only know the start date for an object we indicate that using a blue arrow. The date that the object was acquired by the museum is indicated using a white arrow. Many of events in the timeline overlap. The lives of Andrew Carnegie and the Hewitt Sisters all overlapped one another and they were all alive during the construction of Carnegie's mansion and the creation of Hewitt Sister's Cooper Union Museum for the Arts of Decoration. The life of the mansion overlaps the Cooper Hewitt becoming part of the Smithsonian in 1968 and assuming the mantle of the National Design Museum in the mid-1990s. You can mouse over the name of any individual event to see it isolated from the others. Once enabled the timeline will appear on individual object pages, a little ways below the fold. Big thick borders are big (and thick) and serve to highlight the image by framing it with a larger-than-usual black border and creating a sort of "boundary" between the image and the rest of the page. Rijkscolors are currently disabled as we consider longer-term solutions for cross-institutional browsing and searching. It'll be back soon! 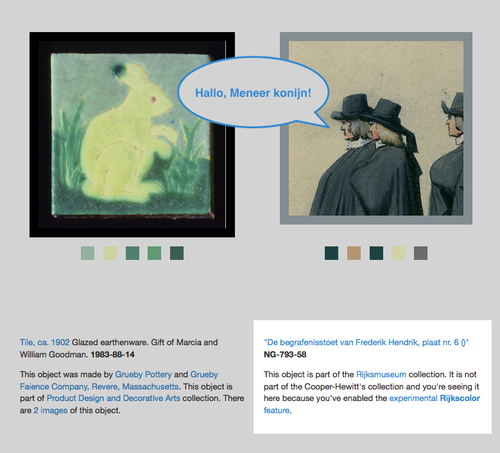 Rijkscolors are an experimental feature that allow you to browse not only images from the Cooper Hewitt's collection but images from the Rijksmuseum by color! We see this as one way to work through the problem of browsing collections across multiple institutions. Not everyone arrives at the Cooper Hewitt (or the Rijksmuseum) with an expert knowledge of our curatorial and collecting history and the sheer volume of "stuff" available can be overwhelming. Color is an intuitive, comfortable and friendly way to let people warm up to the breadth and depth of our collections. 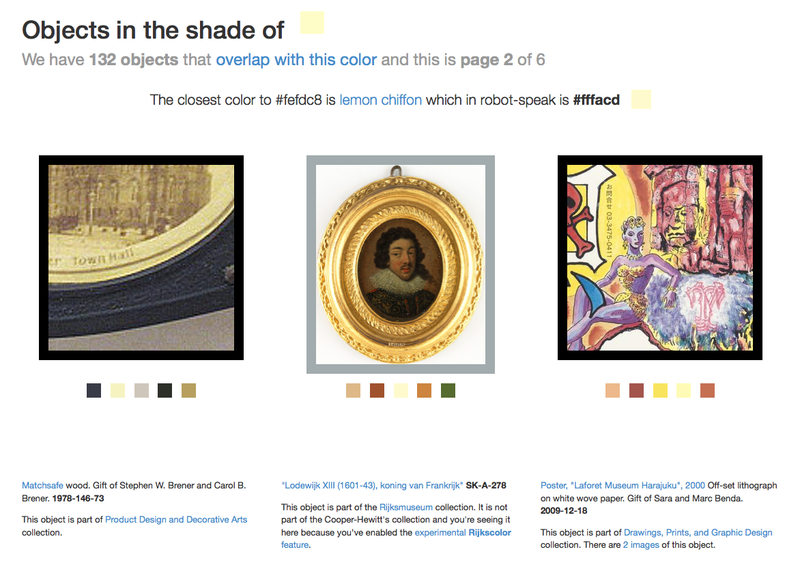 Since adding the ability to search the collection by color it's quickly become the primary way that people browse our collection and as such feels like an excellent tool for browsing across collections. Over time, we hope to add this functionality for many cultural heritage institutions but chose the Rijksmuseum to start with because we share an historical focus in our early collecting practices and because they were nice (read: awesome) enough to make all their collection images available under a liberal Creative Commons license. We then indexed all those images using the same tools we use to extract colors and measure busy-ness or "entropy" from our own collection and combined the two lists. Images from the Rijksmuseum have a different colored border to indicate that they are not part of our collection. Images from the Rijksmuseum link directly to the page for that object on the Rijksmuseum website itself and you can disable this feature at any time by (re) visting this page. There's also long and detailed post about the Rijkscolors on the Cooper Hewitt Labs blog if you'd like to know more. Experimental features are, well, experimental. That still means they should behave properly just like anything else on the site but if they don't we hope you'll be understanding and take it in stride. Experimental features are enabled on a per-machine and per-web-browser basis and can be disabled (or re-enabled) at any time by visiting this page. Enjoy!